With contributions by Didier Anzieu, Harold P. Blum, Tobias H. Brocher, Kurt R. Eissler, Ilse Grubrich-Simitis, Wolfgang J. A. Huber, Eva Laible, William G. Niederland, Pinchas Noy, Hanna Segal, Claudia Sies and Ernst A. Ticho. The main influences on Freud’s thought of German language writers, philosophers, scientists have been surveyed. Two inner conflicts in Freud’s life have also been discussed: a dependency conflict and a conflict between Freud’s wishes to be a creative writer and a scientist. An inner tension produced by these conflicting wishes remained, and Freud’s ability to combine both gifts is reflected in the unique character of the theories and procedures he developed. 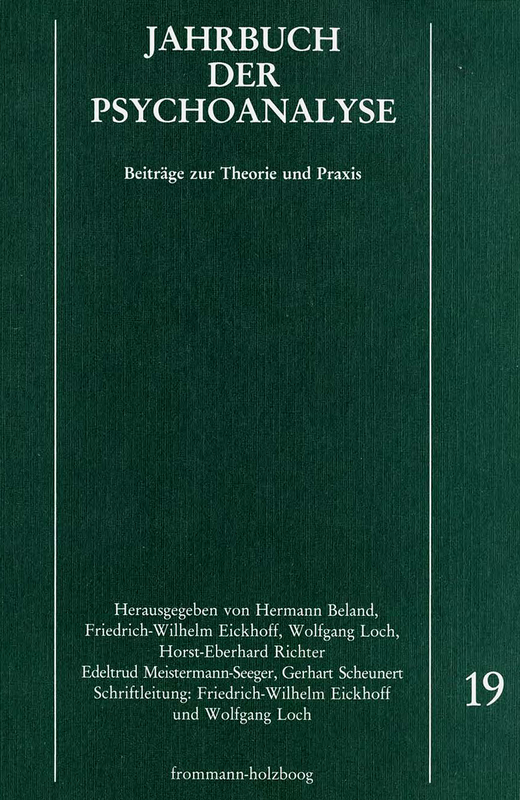 The discussion of the papers of Didier Anzieu and Ernst A. Ticho on ,The Influence of the German-Language Culture on Freud’s Thought’ concentrates on two aspects of the theme. Firstly, the question is considered in how far specific individual words (e.g. »Trieb«), as well as specific basic grammatical structures of the German language (e. g. certain forms of the passive voice; the flexibility in changing between the parts of speech) made the verbal grasp of unconscious and preconscious phenomena easier for Freud, i. e. facilitated the conceptualization of psychoanalysis. The second aspect deals with the young reader Freud’s predilection for those German-speaking authors - from Lessing to Heine - writing in the Enlightenment tradition. Identification with these critical, rebellious thinkers contributed to the consolidation of Freud’s personality. He himself stressed again and again the overriding importance of his steadfastness of character and his disbelief in authority for his life’s achievement: the discovery of the unconscious in spite of inner and outer resistance. A hitherto unknown review of »The Interpretation of Dreams« entitled »Das Seelenleben im Traum« from 1900 was discovered in the »Arbeiterzeitung«, the Workers’ Newspaper of Social Democracy in Austria. The author Emma Eckstein is regarded as one of Freud’s earliest psychoanalytic patients. Interest in her awoke not earlier than 1966 when Max Schur demonstrated her significance for Freud’s history in letters to Fließ thus far unpublished. Not only the significance of Emma Eckstein as a person but also the quality of the text which presents the basic ideas of »The Interpretation of Dreams« with an astonishingly precise grasp of the issue also understandable to an interested layman, justifies the reprint of the paper. Editorial comments, divided into two sections - on the person of the author and on the text - attempt to relate this document of the reception of psychoanalysis at the time of its beginnings to the context of its origin. The greater part of the reality we live in - objects, tools, social institutions, systems of belief, myths, and works of art - is a man made one. So that most of what belongs to our reality today, has its origin in the imagination of somebody living in the past. The problem central to this study is - how does an individual succeed to transform the products of his imagination into the reality of somebody else? The hypothesis is, that one of the basic features contributing to this capability is the special sensitivity of the creative scientist or artist to perceive the conscious and unconscious psychological, social, technological and aesthetic needs of his target group, and his ability to respond to them creatively. Following the presentation and discussion of this hypothesis a special group of patients, called the »self-centered patients« is presented. These patients are characterized by an initial state of relative or total lack of any sensitivity to the needs of others, but in many of them such a sensitivity appears and consolidates as a result of a successful analysis. The assumption is, that if we will understand better the process of change of the patient moving in the course of his analysis from selfcenteredness to reality-orientation (von Selbstbezogenheit zur Realitätsorientierung) we may be able to understand also better how one of the main capabilities responsible for creativity - the special sensitivity to the reality-needs of others - develops spontaneously in the creative scientist and artist.